This doha is a gem. It deals with human psychology, metaphysics and a basic tenet of the Indian philosophy. 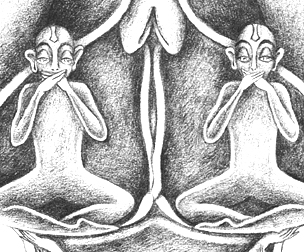 The ancients of the Vedic literature have laid tremendous emphasis on speech. They have mentioned in innumerable shlokas that our speech has a direct connection with our bodily humors. They proclaimed that sound and sight are the underlying source of all vibrations. This has been scientifically proven over and over again. The spoken words - the human speech - flow exclusively with the exhalation of the breath. While inhaling one cannot speak. Thus the Pranava or the breathing system itself makes the speech a process of the outgoing phenomenon. Words once spoken cannot be retrieved. Hence instead of being apologetic or remorseful later on, it is better to maintain the proper checks and balances on one's speech. We know that all sounds create vibrations. And these vibrations affect both the speaker and the listener. Soothing, compassionate and loving words breed togetherness, while harsh speech breeds hatred. And, we also know that human speech is one of the main ingredients that differentiate mankind from the rest of the animal kingdom. Thus, with the above perspective we can deduce that Kabir, in this doha crystallizes the power of the spoken word. He teaches us to speak in such a manner that keeps us harmonious and composed thereby making the listener feel a sense of joy in the communication. Can anyone share this song in full with both Hindi and English lyrics ? "Mann Ka aapa khoy" Mann is mind, khoy is lost or remove/gone,. aapa khoy is to loose that agitation thoughts & emotions associated with what your senses perceive as real, or doership or ego) & to go into a trance or state of meditation (oneness with the Supreme Reality). So yes, the tone or voice, when one prays or chants, full of love & compassion, one should always be in that state (state of Self-Realization or Nirvana, Moksha). Which brings calmness, cools your mind & body., and also gives hope & happiness to others. The Key to understanding this Doha lies in the second phrase' Man Ka AApa Khoye" To Speak without fear and when one does so without ones own ego, then the words are selfless, educating full of compassion and love than you will speak words of wisdom which will be soothing for others and yourself, This Doha is not about speaking soft and pleasing words, its about thinking and speaking without our ego and selfishness. I used to read Kabira's Doha before a long time ago when i was in 6,7,8 classes but this time i have the same interest to have a focus on them. Spoken words should always be soothing and healing. So weshould always remember this doha. once you say rudely bad things to other person,observe yourself.You take a tension in your mind.on other aspect the person thinks bad about you.so its good to talk smoothly to everyone. implement this in ur own real life, u'll get d grt rslt very soon. very inspiring nd damn true..
Execllent.They have made my day. student ko jaroor ye doha padna chaheye. kabir was a very knowledgeble poet. agar Kabirjike chand labzo pe jivan jiya jaye to........mano swarg hi prithvi pe hoye!!!!! So beautifully simple and intensely inspiring, I always loved Kabir, never had paid attention to other things taught in hindi, but Kabirji's Doha never missed my attention!